Hi, everyone! 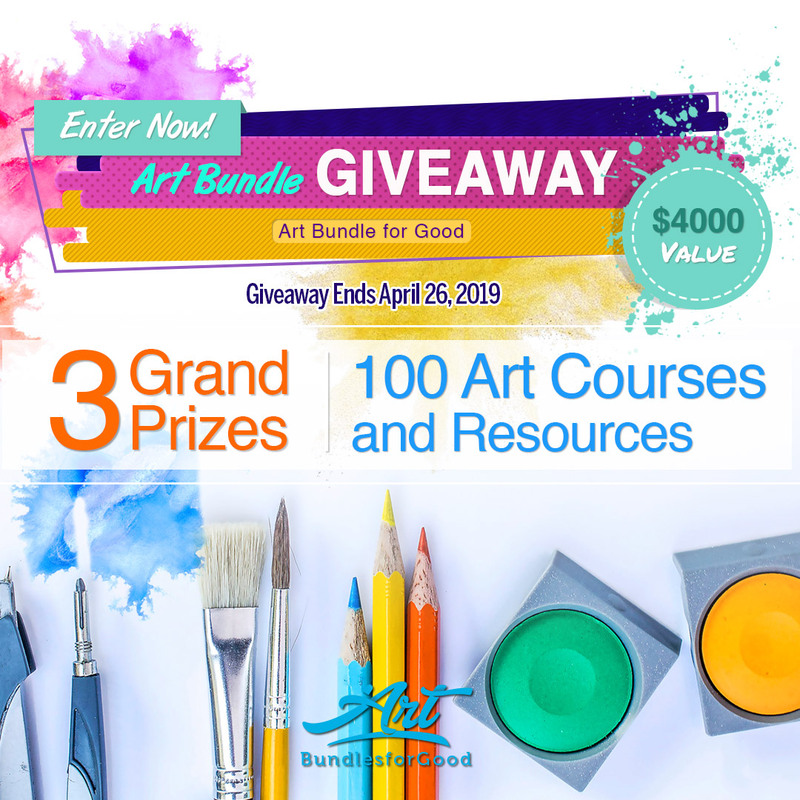 Ann Butler here! I love testing products and seeing what I can do with them, beyond their original use. 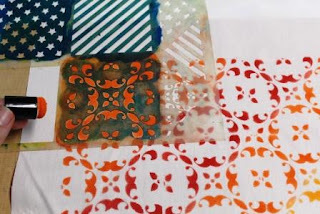 For this post, I am sharing a technique for Creating an Ombre Effect with StencilGirl® Stencils…Actually creating a 12” square Ombre Effect from a 3” square stencil. 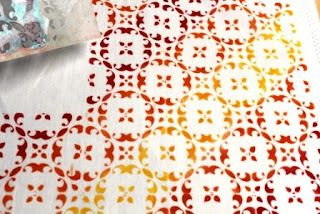 This is the perfect size for a pillow or the beginning of a table runner or quilt! 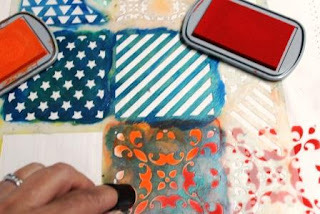 Optional: Brush on a thin coat of Stencil Tac to the back of the stencil. Let dry. Place the desired 3” square from the stencil in the lower right corner. 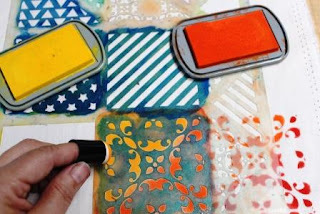 Apply Fire ink over the stencil square using a dauber. This is row 1. 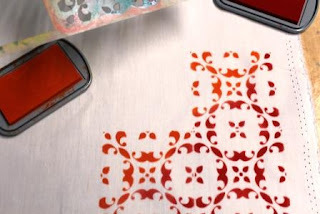 Line up the stencil right up next to the pattern you just created. 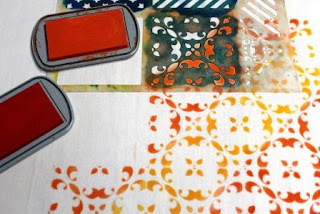 Apply Fire ink over the bottom right corner of the stencil square using a dauber. 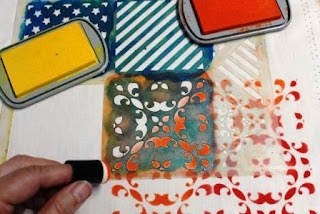 And then, apply Tangelo ink over the top left corner of the stencil square using a dauber, blending into the Fire ink. Repeat step 3 directly above the first pattern created. This is row 2. Line up the stencil between the 2nd and 3rd pattern. Apply Tangelo ink over the bottom right corner of the stencil square using a dauber. 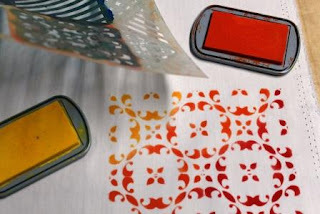 And then, apply Sunshine ink over the top left corner of the stencil square using a dauber, blending into the Tangelo ink. Repeat step 5 on the left side of pattern 2 and above pattern 3. This is row 3. 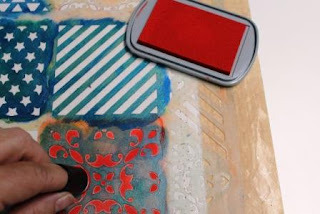 Create row 4 the same as previous rows using Sunshine ink in the lower right corner and Tangelo in the upper left corner. You will have 4 squares with these colors. NOTE: Now the pattern is 4 squares high and 4 squares wide. You will not increase the height or width. 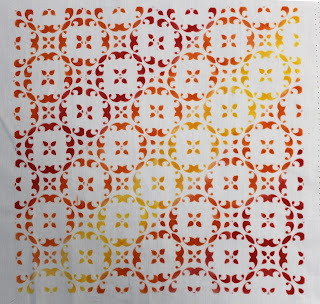 Create row 5 using Tangelo in the lower right corner and Fire in the upper left corner. You will have 3 squares these colors. 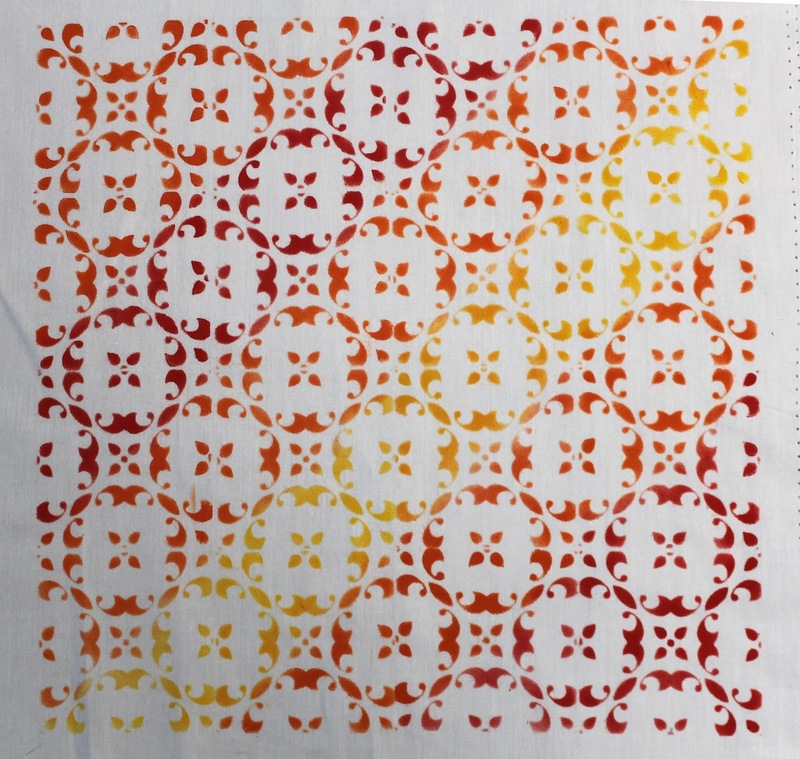 Create row 6 using Fire in the lower right corner and Tangelo in the upper left corner. You will have 2 squares with these colors. Finish off the last row with Tangelo ink over the entire stencil square. Iron to heat set. 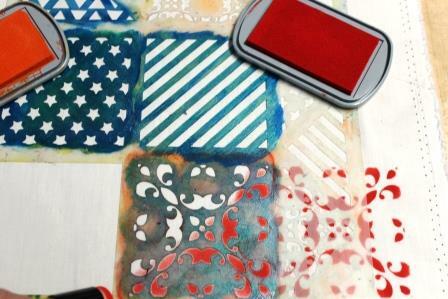 NOTE: Use baby wipes or paper towels as needed between colors of ink. 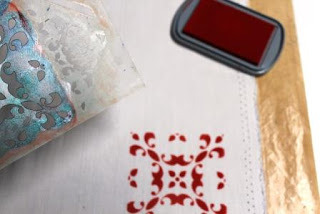 NOTE: I use my stencils a lot with fabrics and use a product called Stencil Tac, on the back of the stencils to help keep them in place. Stencil Tac, is a temporary adhesive that helps to keep my stencils attached firmly to fabrics and avoid any leaks when applying paints and inks. 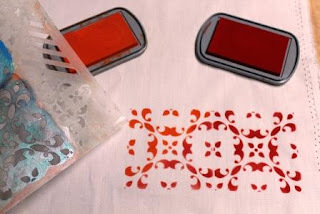 You check out this video for Stencil Tac How-to: https://youtu.be/yC9ljMojn9E if you want to see how to apply it on your stencils. This is a beautiful ombre! Those colours together remind me of a sunrise or sunset. I love this technique!!! It's such a beautiful use of the stencils and the inks! Love it!